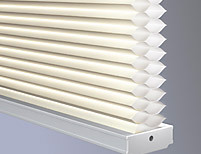 Sivoia QS Wireless insulated honeycomb blinds offer incredible value at an affordable price, backed by the quality of the Lutron brand. Featuring patent-pending Triathlon power technology that provides a 3 year battery life, you will enjoy years of constant operation without worrying about battery replacement. And, because they operate via a remote, you can adjust them from anywhere in the room. Control options include, Pico Wireless Controls, seeTouch QS Wireless keypads, GRAFIK Eye QS Wireless and HomeWorks QS. 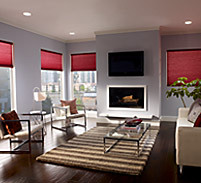 Lutron insulated honeycomb blinds are as functional as they are beautiful. 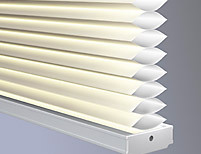 They come in varying opacities from sheer and translucent to room darkening, allowing you to achieve the optimal level of light control and privacy for your space. 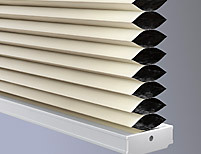 In addition, all insulated honeycomb blind fabrics have a white backing that acts as a reflector, to help keep your space cool and comfortable. With these dual-sided fabrics, you can give each room a signature look while maintaining a uniform appearance from the outside.